He was the inspiration for The Man of Steel, but still The Man of Bronze can't land an ongoing ongoing. Why, I'm not sure. 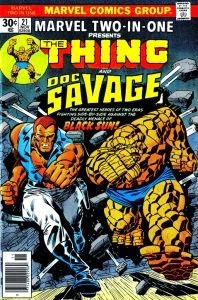 Not only does the Doc have the best logo in all of pop or pulp culture, he's personally been at the forefront of my mind when it comes to action heroes, ever since he teamed with my favourite Marvel hero of the 80's, The Thing, in an issue of Marvel Two-In-One (which also needs a revamp). This month, Dynamite Entertainment attempts to break Doc's comics' curse, launching an all-new series. 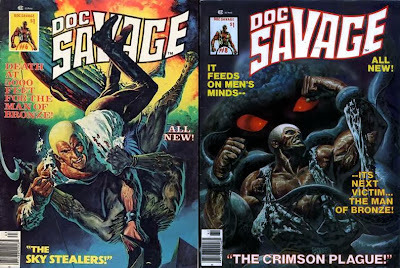 Wanting to highlight the good Doc's return, but having already written my opinion on why Savage still stings when DC ponied up a few new issues a year or so back, I was stuck as how to highlight his return. That is until Karl Disley offered his views on the pulp-icon's return and what it means to him as fan. How can you say no to that kind of gold? 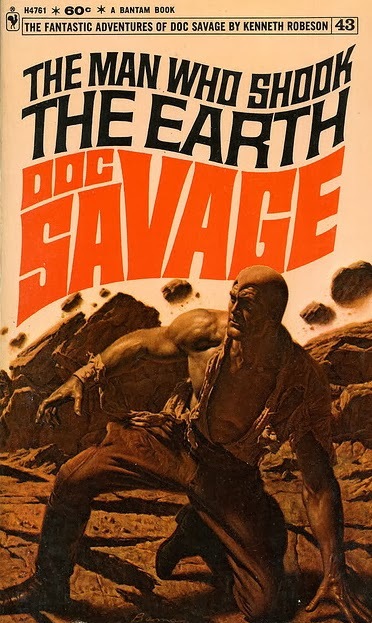 "My memories are rather extensive regarding this fave of mine from way back...it's difficult, nay impossible to think of a comic publisher who hasn't taken a crack at Doc Savage. Over the years the rights to publish him have landed invariably with some measure of success between Marvel, DC, Millenium, Gold Key and Dark Horse. Some have made a hash job of it, some better than others, but mainly for myself, the series which most faithfully captures the tone and feel of the original pulp novels is the eight issue run produced by Curtis Magazines, a mid-stream Marvel imprint, in the mid-70's. God, try saying that every morning! Clark Savage Jr (aka Doc), was the creation of publisher Henry W Ralston and strict Catholic editor, John Nanovic at Street and Smith Publications. But for many, the man most associated with our hero is writer Leslie Dent, who under the pseudonym Kenneth Robeson penned nearly every one of the amazing 181 original novels during the 30's and 40's. Doc Savage is regarded as forerunner to many of todays heroes - he had money like Bruce Wayne, ran a tight team of heroes from his skyscraper headquarters like the FF, and long before Superman built his Fortress of Solitude, Savage had his own Arctic base, with a plane on permanent stand-by at the equator. He would undoubtedly have become a relic of the Art Deco era, long forgotten, until in the early 60's Bantam Books began republishing the books, most with gorgeous painted covers by James Bama. These helped repopularise the character and paved the way for the 1974 well-received George Pal TV movie [which everyone remembers!] Doc Savage: The Man of Bronze, which starred a post-Tarzan Ron Ely. In the early 70s, riding on the success of the TV movie, it was Marvel's turn on the dubious merry-go-round of publishing and thus we got four adaptations of Dent's novels, in the traditional four-colour format, two stories per issue. These were repackaged in a collected edition by DC in 2010 and are in my opinion well worth checking out. Marvel teamed Doc with their best known property, Spider-Man in Giant-Size Spider-Man #3 and also memorably with the Thing in Marvel Two-In-One #21 - an intriguing tale in which both their narratives are run in parallel for the first half, each in his own era, until they finally meet on page 13. In between, Doc appeared in the black and white semi-adventure magazine called simply Doc Savage, a typically classy Curtis production. Ken Barr provided lurid painted covers for all but the first issue, superlative portraits of Doc, shirt forever ripped, muscles forever straining, in permanent combat with some outlandish foe; a snake-man, a half-robotic scientist, a giant moth, a red-eyed tentacle monster... it was all on offer for him to fight. Doc's image was highly stylised in accordance with the Bantam book covers - his hair was close-cropped, white/ash blonde, with a widow's peak so sharp one thought he could use it as a weapon. That image was carried over into the interior art, which Marvel demanded gave him a 'costume' of sorts [for public identification] which consisted of open-necked high-collared shirts [that never stayed unripped] jodphurs and knee-boots. An attempt to give him a mask in issue three was quickly and thankfully aborted at the planning stages. 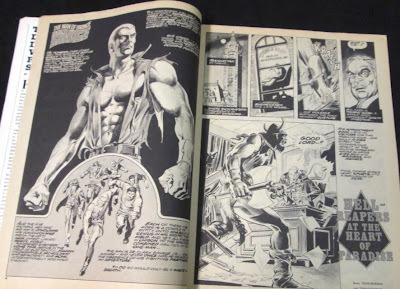 Several artists served good tenures on the book, as follows; 'Big' John Buscema, Marie Severin, Val Mayerik [mainly on pencils], Ernie Chan [supplied full art for issue 8], but for most, the overall defining look came courtesy of Tony DeZuniga, who inked most of the stories and pencilled and inked three. His elegant feathery artwork and skilled use of wash shading [a technique not used anymore, sadly] ensured the book looked slick and professional. Great art alone tho is only matched point for point by the stunning Doug Moench, who elected to write all-new tales for the Doc, with all the key elements that made the novels so trashily gaudish. Doc had five companions/assistants that accompanied him wherever he went, part fan-club, part fellow mercenaries/adventure addicts looking for action all their own. And Moench characterised them to a capital T.
Apeish chemist 'Monk' Mayfair is forever squabbling with his sparring partner, best friend and effete lawyer 'Ham' Brooks. Dour but reliable engineer 'Renny; Renwick regularly delivers his trademark 'punch through solid oak' and never suffers fools gladly. Bespectacled electricity expert 'Long Tom' is frail-looking but scrappy in a fight, while sesquipedalian archaeologist 'Johnny' Little John utters his catchphrase 'Well, I'll be superamalgamated!' at least once per strip. Other classic Doc elements present in Moench's scripts were the Amberjack zeppelin, the Helldiver submarine, the autogyro and the faintly hilarious 'flea run' - a pneumatic tube that whisked our heroes from Doc's 86th floor skyscraper apartment to his privately-owned dockside Hidalgo Trading Company hangar - not forgetting his cousin Pat - determined to prove herself the equal of any male [with a nice line in judo] but who always ended up causing trouble. Moench's clear, linear plots are a reliable melange of pulp types. Typical of some film noir, most tales opened with a visitor, usually a beautiful woman [i.e. trouble] enlisting Doc's aid. There are also trails and trails of clues, making reading an absorbing experience - try the complex anagrams in #1, they are particularly good! More often than not, the baddie is your bog-standard masked megalomaniac with world-conquering ambitions. Otherwordly phenomena such as ghosts and monsters were discovered to have solidly scientific rationales [by the scientific standards of the day], although there is still room for the ubiquitous hidden subterranean civilisations, bizarre robotic creations, and plenty of good old mutation-causing radiation. In closing Moench 's Savage Tales are imbued with fidelity and true love for the original. No concession is ever made to modernise or rubbish the original novels. Some would say they even surpass Dent's own work, which towards the end, began turning very formulaic and were written in great haste to meet deadlines. Dent himself dismissed these as 'reams and reams of sellable crap'. The only thing wrong with Marvel and Curtis's Doc Savage was its abrupt cancellation after only eight issues, as part of the company's cutbacks. But you know what - the run in retrospect is all the sweeter for being so short-lived. Doc Savage - the Bronze medal of pulp heroes. What do you think? Thanks again Karl for sending through such an awesome set of memories and sharing your thoughts on Mr Doc Savage! 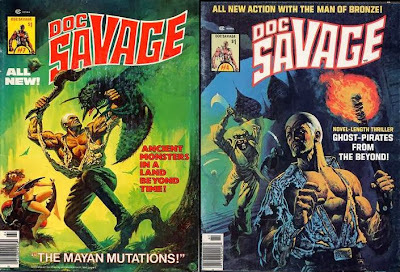 If you have memories of a character that means a lot to you, feel free to send them to me at iadwmailbag@gmail.com - then watch for Doc Savage, this month from Dynamite! Wow. Hell of a history lesson there Karl. Definitely learned some new things. 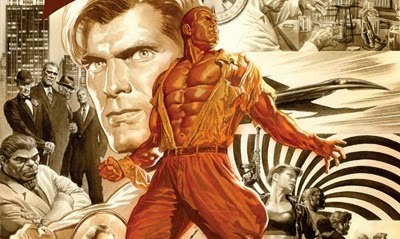 What'd you think of the Shadow/Doc Savage team-ups? Plus I'm sure you' ve had to have seen and read the Ellis' version of Doc Savage, 'Doc Brass" in Planetary. I'd say he really did the character and legacy proud. It's always a good time to re-read Planetary. "A Superman before Superman." That's very apt. A hero for those who could only dream of being that smart, that fit, and that rich. Escapism and Idealism rolled into a lovely package, and an art form that has never gone out of style, even as it's gone out of print. Ive seen the Shadow/Savage hook-up and thought it was okay - surprised it hasn't been thought of before. I only got Planetary because of the riff they did on the FF with their evil version; was pleasantly excited about that storyline.